Mountain lions require a lot of room—only a few cats can survive in a 30-square-mile range. They are solitary and shy animals, seldom seen by humans. Mountain Lions are extremely agile creatures. Their long hind limbs allow them to cover a distance of 40 feet in a single leap. What does the mountain lion eat? Mountain Lions are carnivores. Their diet can consist of deer, elk, moose, and big horn sheep though they also eat smaller animals such as coyotes, raccoons, rabbits, squirrels, mice and rats. They are capable of taking down animals that are many times their own size. They will eat just about any hoofed animal that they cross paths with. The average adult Mountain Lion can easily consume up to 10 pounds of meat every single day. For a human that would be the equivalent of eating 40 regular sized hamburgers. The lifespan in the wild for a Mountain Lion, if they do live past those crucial first couple of years, ranges from 8 to 13 years. This is compared to 20 years for those that are born and raised in captivity. How many mountain lion can be born at a time? The young Mountain Lions are called kittens and they are well cared for by their mothers. She may have from 1 to 6 of them at a time. She is extremely protective of them and will fight off huge predators including Grizzly Bears. They will be weaned from the milk when they are about 3 months of age. The habitat and distribution of the Mountain Lion spans a greater distance than for any of the other wild cats. It is a native of the Americas but is also found in the Western Hemisphere, the Yukon, Canada and the South America Andes. Owing to its wide range of habitat, the Mountain Lion is known by a number of names like panther, puma, yuma puma, Florida Panther, Catamount, Cougar and Mountain Screamer. However, it has over 40 names in the English language. For this feat, it holds a Guinness record. Despite its strength and hunting skills, the Mountain Lion is often not included among the big cats. This is because it can’t roar, and its physical make-up is more like smaller cats. Mountain Lions are extremely agile creatures. Their long hind limbs allow them to cover a distance of 40 feet in a single leap. These cats are very territorial. They attack any one they consider to be an intruder to their territory. The tail of a Mountain Lion can be about 3 feet long; it helps keep them balanced. Cascade and Canyon came to us in 2002. Their mother was raiding a goat ranch up north and the rancher shot her. Fish and Game noticed she had been nursing babies and they went to look for them. They found 3, two week old babies, all females, and took them to their facility nearby to care for them. The babies had ringworm and some intestinal problems, but after another two weeks, they were doing well. They were imprinted, however, and could not be released back into the wild. Fish and Game wanted all three to go to a facility together, so our zoo took all of them when they were about 4 weeks old. Unfortunately, we lost the smallest female, Peg, when she was about two years old to a form of cancer. The other two are doing very well and are very large for females. 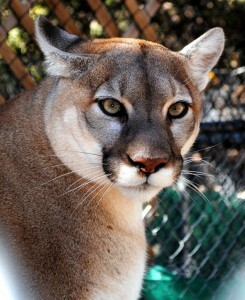 They are probably the most easy going Mountain Lions we have ever had.